Hortus Camdenensis | Crowea saligna Andr. Frost tender, open-branched shrub with slender stems, narrowly elliptic leaves and bearing solitary, waxy pink flowers, 3.5cm across, from the leaf axils in summer and autumn. To 1.5. [RHSE, FNSW, Beadle]. ‘Its blossoms are produced in great profusion during the autumnal months, lasting quite till winter; the leaves when rubbed are fragrant.’ [LBC no.310, 1819]. 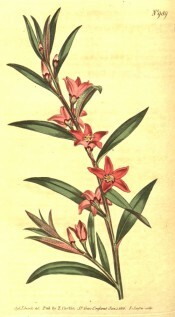 ‘This genus was established by Dr. Smith and named in honour of the friend of his youth and early instructor in the science of Botany, James Crowe, Esq. […] A native of New-Holland, and one of the handsomest flowering shrubs that has been as yet introduced from that country. Our drawing was made some years since in the garden of E. J. A. Woodford, Esq. then at Vauxhall. Requires to be preserved in the greenhouse during the winter, but should have plenty of air in mild weather. May be propagated by cuttings. Flowers the greatest part of the year.’ [BM t.989/1806]. Introduced to Britain in 1790. [JD]. ABR pl.79/1800. Listed only in the 1857 catalogue [T.356/1857]. Crowea saligna was ticked in a copy of the Horticultural Register, October 1831. Although this originally belonged to James Bowman, it is likely that this plant was grown by Macarthur earlier than 1857. Probably sourced locally. More details about Crowea saligna Andr.